Configure IP addresses (omitted here). Configure IGP protocol between PE routers (omitted here). Configure MPLS and LDP on PE routers (omitted here). Configure MP-BGP relationship between spoke PEs and hub PE (omitted here). Create VPN instance on spoke PEs and set different vpn-targets for export and import. Create two VPN instances on hub PE. 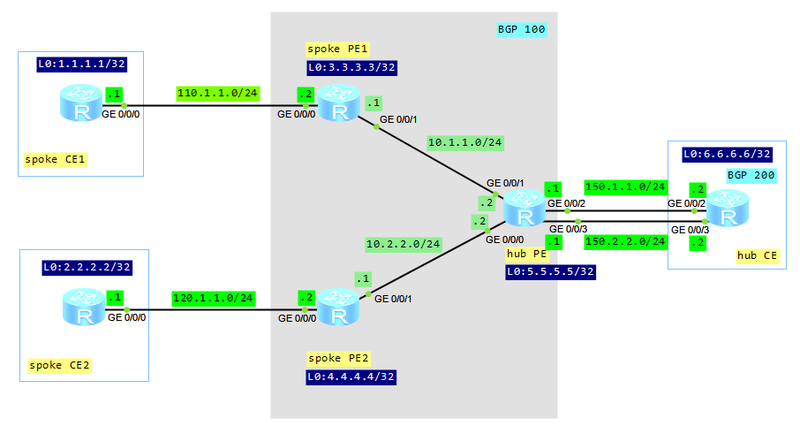 Configure static routes between spoke PEs and spoke CEs. Configure EBGP between hub PE and hub CE (the hub PE must be configured to permit the existence of repeated local AS numbers). The export target of spoke PE must be equal to the import target of hub PE. The import target of spoke PE must be equal to the export target of hub PE. The import route target of a spoke PE is different from the export route targets of other spoke PEs. A hub PE requires two interfaces or sub-interfaces. One for receiving routes from spoke PEs, and the import target of the VPN instance on the interface is spoke. The other advertises the routes to spoke PEs, and the export target of the VPN instance on the interface is hub. If EBGP runs between a hub PE and a hub CE, the hub PE performs the AS-Loop detection on the route. If the hub PE detects its own AS number in the route, it discards the route. In this case, to implement the hub&spoke networking, the hub PE must be configured to permit the existence of repeated local AS numbers. We don’t have such situation in case of IGB connection between hub PE and hub CE. Let’s look how it works. Comparing these outputs we can notice that the routing information, advertised by a spoke CE, is forwarded to the hub CE and hub PE, before being transmitted to other spoke PEs.